So on Saturday I managed to paint my first survivor for the Walking Dead miniatures game, and I'm very very very happy with how she turned out, especially for the time I spent. I knew since the game arrived that this model would be the first survivor I'd paint. Andrea was my absolute favorite character from the comic (who was given a disservice in the television series, yet her character was still enjoyable). She was a person who didn't want to be a victim and took training into her own hands, and managed to become one of the most reliable soldiers of the group and the best shot. It didn't hurt that she had the best sculpt of the game in my opinion. Very rarely do we see sculpts of characters squared up for shooting. 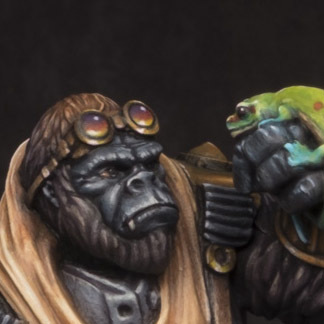 There's a possibility of this pose being a difficult sculpt or something, or perhaps it's not a dynamic pose, but I find myself wanting to see more of this in miniatures. It's also great to see a female character not cheesed up with skimpy outfits or over-emphasized body shapes. Don't get me wrong, I do enjoy these models, but they permeate every game I have or look at and we need less emphasis on games overall. I like a good cheesy model, especially in anime based games, but it's not needed everywhere, and in this game it would betray the character anyway. So I started out with my mantra in mind (get it table ready) but wanted to spend a little more effort on the survivors as they are the stars of the show. 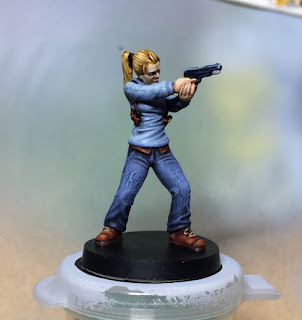 With this in mind I thought of quick techniques to utilize that still look professional - smooth textures for the shirt and leather, but drybrush for the jeans for speed. Lighter washes throughout the clothing to give smoothness and speed. So with a light grey basecoat I sprayed 50/50 VGA Wolf Grey/VGA Shadow Grey for a lighter blue gray base. I then zenithal sprayed Wolf Grey then a light spray of Wolf Grey/White for the final highlights. I took SWM Storm Cloud Wash, which is a close color to the blue greys of Shadow and Wolf, mixed it with a few drops of GW Lahmian Medium to give more matte to the finish while keeping the wash viscosity properties, and a drop or two of water to make it more runny. I took this wash and heavily washed the shirt to tone down the white/lightness and provide soft shading throughout. Secret Weapon washes are excellent for this, as they're one of the only companies I know of that make light toned washes. They even have one that is a bright yellow green called Fallout. 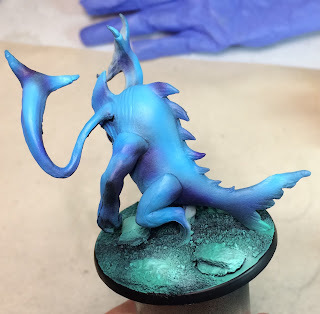 Having light washes is a good way to shade really bright tones and maintain its lightness, and most companies make very dark washes because it works most of the time. With the jeans I based it with a few layers of GW Shadow for a solid opaque coating. I heavily washed with GW Nuln Oil, then drybrushed with GW Shadow and GW Space Wolf Grey (forgot the new name of this) to build up the highlights lightly and create that rough texture. Drybrushing has been a nice relief of a technique to use lately. Although I don't like the messiness of it (I like a lot of control for my blends) it's been nice to accept it as a valid technique for speed. I used my usual Vallejo/Angel Giraldez recipe for the red leather on her straps and boots. For the hair I based with VGC Goldbrown, washed with GW Agrax Earthshade, and highlighted with VGC Goldbrown mixed with successive additions of VMC Dark Sand. I think I successfully reenacted Andrea's dirty blonde hair! I was really proud of her eyes, as I tried a different technique for painting them. I'm getting much more accurate with these, although it is a frustrating element of painting. It's one of those details that is just so annoying to do, and I always have to redo eyes for every model which risks parts of the paint drying thicker in different areas and affecting the dot of the eye's application. But when you get this right it unlocks a higher level in your miniature and draws the attention to the face even more. Of course, I had to include a picture of playing around with my toys! Pretty soon I'll have a demo set up fully painted! 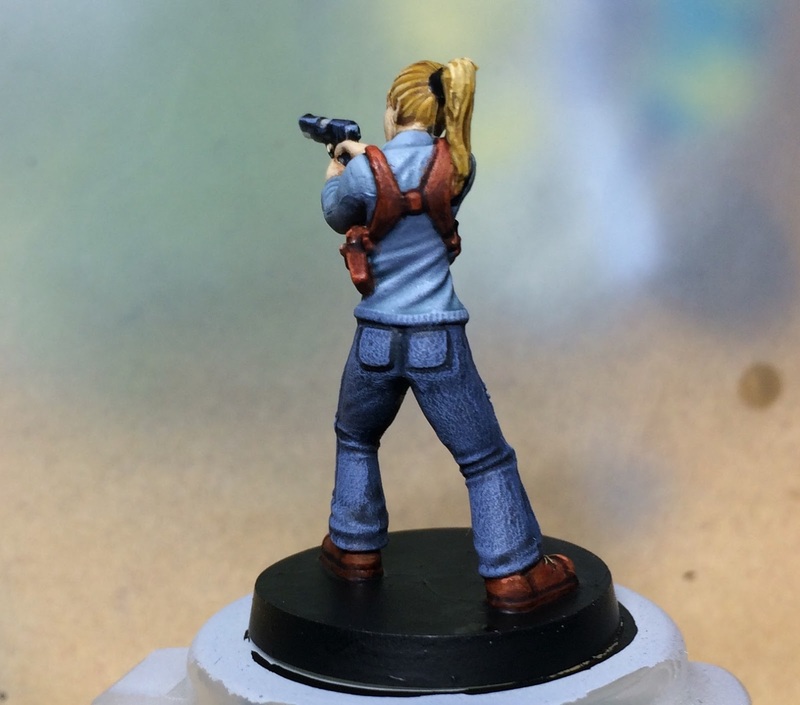 I'm concentrating on getting two crews of equal level survivors painted, which means I have to figure out what combinations are good for demoing the game first. I am not much of a fan of having Rick/Carl going against the generic scavenger gang, as it doesn't inspire much enthusiasm in me. I was thinking of having Rick/Carl go against Andrea and her sister as an even match, and maybe including one more beater on each side. Fans of the Walking Dead may not like Andrea going against Rick, but I think they are better models to display the game's range - Rick and Andrea both reflect strong characters with support models like Carl & her sister Amy that need protection give the leaders some synergy. Anyway, let me know what you think! See you next time. Long time no post, as usual! So I did quite a bit of hobby stuff recently and thought a good update was in order. First up: my Novus building that you may recall from waaaay back in the day. Get your crap at least table ready. 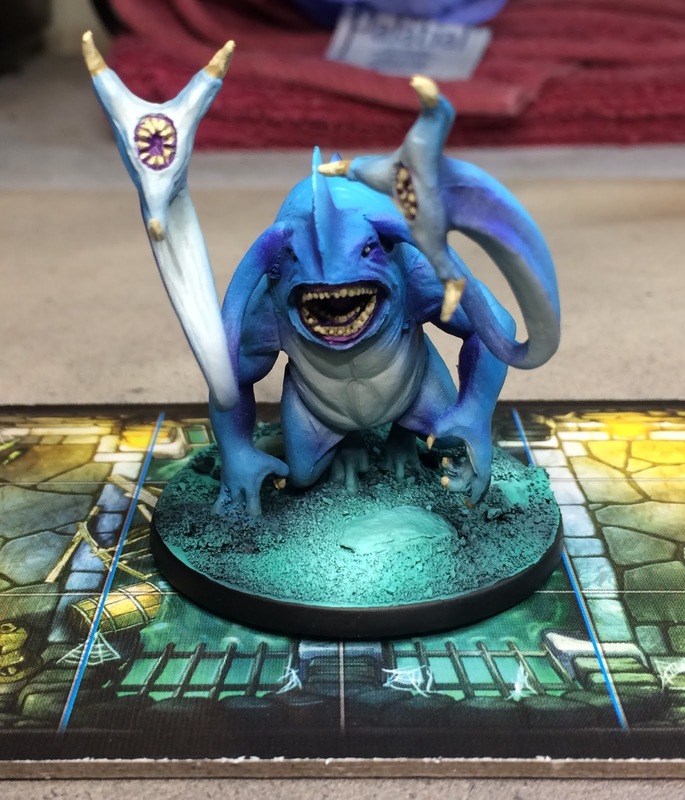 The flood in Houston forced me to consolidate all my hobby stuff and move them around the house, which when all piled together really became overwhelming when seeing all the stuff I have, and how none of it is completely painted. So I'm going to try to get things at least presentable when I can, meaning actually painting rather than just thinking of painting. An hour here, and hour there, it all adds up and gets crap done. So when I saw this building again I decided that's what I'll do, starting with this building, and did it. I Kickstarted this game a while back, and even though I was hesitant when it first came out by the end of the campaign I was really excited to back it and get it on the table. When it arrived I played a few solo games but nothing serious, I mostly used the cars for terrain for other games and even the supply token pieces. I never really tried to get it on the table for our regular gaming group, though, as we usually played Malifaux and it just collected dust. Recently, though, one of our regulars expressed interest in other games as Malifaux is starting to feel tired - this will happen when it's what your main game is (in our group) and it's played multiple times a week since 2013, which is when at least I joined the group so it's even longer for this player. When I thought about my catalog of games that might be interesting to introduce during this opportunity I brushed by my copy of TWD and figured why not. 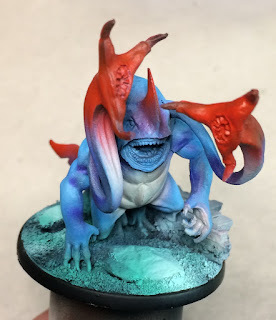 These were my test models for quick-painting concepts. 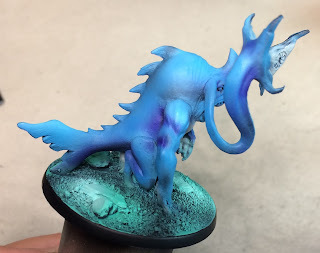 I figured I'd rely heavily on washes and drybrushing (I hardly drybrush ever, so this shows that I really want to get these done lol) and came up with a recipe/paint order that may very well get the job done, and it's similar to how I painted my old horde Vampire army in Warhammer Fantasy. For the skin, it's 50/50 VMA IDF Green/VGC Dead Flesh airbrushed on, then zenithal with VGC Dead Flesh, then a heavy wash of SWM Stone wash, then a drybrush of VGC Dead Flesh and a bit of white, followed by a spot wash of GW Green for shading and tone. A few dashes of GW Blood stuff adds contrast to the overall green tone. 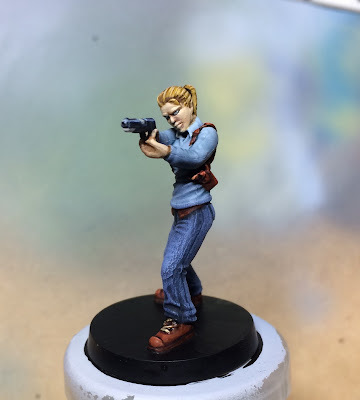 For any other elements like clothing I just base, wash, drybrush, repeat as needed. As I said, really trying to get this done fast and not get held up on details like I normally do, and I feel like this recipe is a good balance between speed and aesthetics. While I painted those I got started on the trucks that come with the game (for the KS version). I knew I wanted a red and a blue truck, as my wife used to own a cool red Chevy and when we first met we drove around in her blue Chevy, so I undercoated one with Black/Cold Grey/Light Grey then hit it with Scarlet Red like the Novus building. Then I washed it with GW Agrax Earthshade for quick weathering and did a few other elements like the windows. The vehicles aren't done fully, as I need to pick out elements like the grill and hubcaps, and weather it even further with stippling and paint chipping, but as I said earlier - just get my crap table ready, so I did. I couldn't help myself! I recently bought a Walking Dead mouse pad mat from our FLGS in anticipation of my recent motivation to get TWD table ready. So I plopped on some Battle Systems terrain, a few trees, etc. and before you know it I've got a pretty sweet table ready to rock this game! With its small model count I may actually get a game fully painted and ready for demos! I have to admit I really like the small table size and model count, but when you have about 10 or so zombies on this set up you can see exactly the claustrophobia that this game meant to induce in players! It's going to be fun and intense. 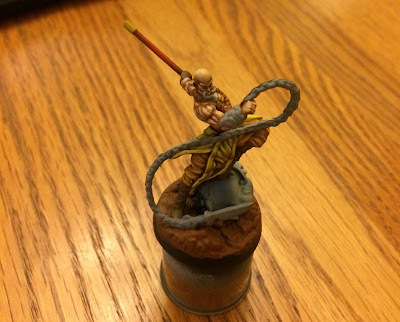 I started and almost completed Rosamu from the board game Yashima. I've always liked this game and its miniatures, and thought it could double as a model in A Fistful of Kung Fu. I painted it mostly by brush, so it felt like painting with one hand tied behind me as I've heavily airbrushed for the last few years, but it's nice to get back to your roots - I just shouldn't have done so after picking orange and yellow as my colors, because man I forgot how tedious and painful those colors are when painting by hand! The difficulty and disappointment actually led me to stop painting this guy for now, but - and this is my new mantra - he's table ready! That's it for now, I'll keep in touch when I can! 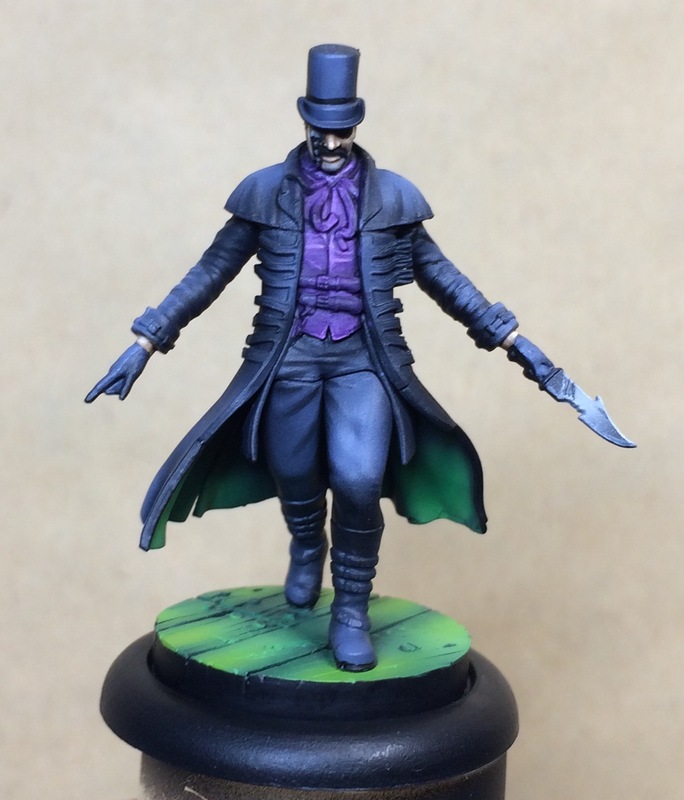 Montag's Tourney 10/28/17, Painting updates, and Hamelin!!! It has been quite a while, but I came back with actual updates! 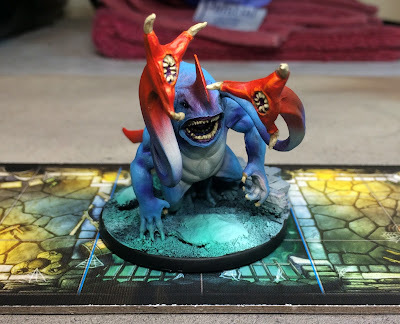 This time it's painting, along with a Tournament last month. First up, Schrodinger's Cat! This is a limited edition proxy crew for Hamelin, this guy in particular is a replacement for Nix. I had a ton of fun painting him, and I worked with some fluorescent orange pigment to do the glow on him. I really liked playing with the idea that he was phasing his tail through himself, he is incorporeal after all. Along with Nix I'm working on the Midnight Stalker, this is a WIP but he's mostly done. I've got to finish the base, highlight the black, and put in some accent colors. This guy has been worth his weight in gold in games though! 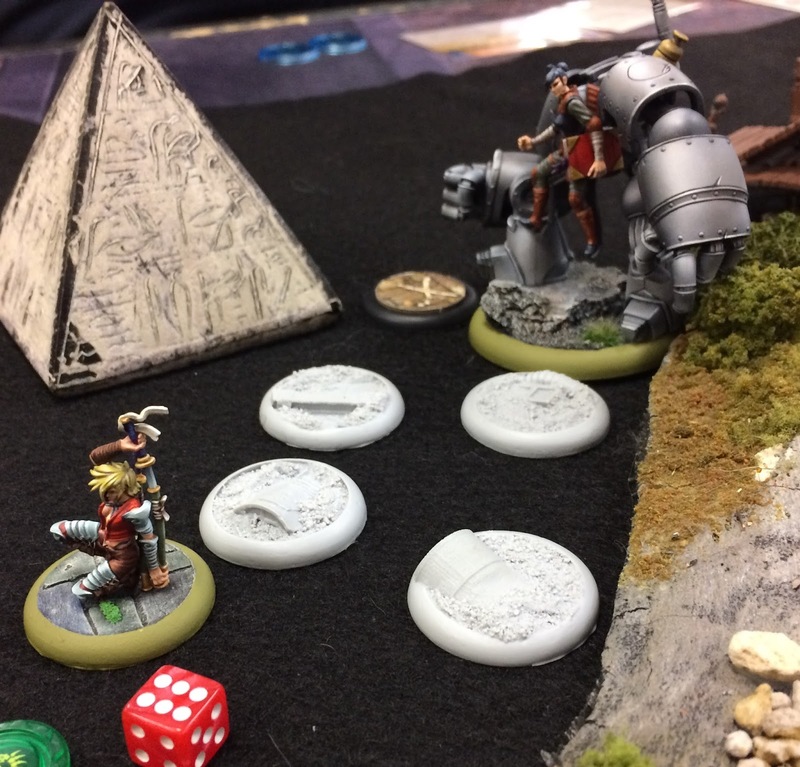 Speaking of games, there was a small tournament held at Montag's on 10/28/17 and it was my first test of using this crew in a tournament setting. Overall I won 2 of three games, losing only to Dreads' Sonnia list - which is a very bad match up for me - and even that game wasn't terrible in differential for me. I won this game at the end of turn 3, the score ended up as 6-1. Nix essentially controlled the entire left side with some backup by Hamelin, kept him from scoring Guard the Stash, while Hannah held the other side and got support from Bleeding Disease sources like the Obedient Wretch and Stolen, occasionally the Midnight Stalker would come in and hold models from moving closer to the Stash,. This strategy right here I discovered in the middle of this game, and now it's a staple! I knew this game was going to be an uphill battle from the start, Sonnia is one of my worst match ups I could have against Hamelin. He ended up blasting my rat engine to pieces from turn one from a very long way away. I managed to crawl back and get Nix and the Midnight Stalker into his crew and build up the blight from the Plague Pits. I ended up only losing 3-5, so not terrible. The awesome thing is, though, that I discovered with the combination of the Midnight Stalker and Plague Pits prevents the elimination of the marker (unless you have Don't Mind Me) and just absolutely piles on the blight! Even with condition removal, Dreads' models were gaining a large amount of blight in short amounts of time. This game was relatively fast. I had control of most of the game, and after I engaged with Nix on turn 1 it was hard for him to get out of the area while I was killing multiple models. He called it early on turn 2 or 3 so it was 10-1 in my favor. In the end I got 3rd - and the certificate didn't have anything filled out on it :( but that's ok. I plan on providing more insight into my new iteration of Hamelin as it is quite a competitive list with the new upgrades from Book 5. Right now it's tough to get free time, especially since it's the day after Thanksgiving right now, but I also plan on painting more regularly as I have lately. Again, long time no post. Work has been getting crazier and crazier, with each new success comes a new responsibility or project, so real life is taking priority over my hobby stuff lately. I think I'll be able to gather some more free time soon enough, the end of the quarter usually helps with less office time. But I've also started traveling for work, and it's sounding like there might be more of that in store so who knows. Anywho, even though I haven't done anything new with painting I managed to make it to a Malifaux Tournament in Austin last week! Sadly it's the last one being hosted by their resident Henchman Robert Stull - he's been incredible with support for both his community and the Houston community, and his presence will be sorely missed, but he's going for bigger and better things so we all wish him luck! I hadn't played very many games prior to the tourney, probably about a month straight of not playing so I knew I'd be pretty rusty. I stuck with only bringing my Viktorias again, as I'm used to the meta and feel that the crew is working so well now with the Hodgepodge Emissary. I was pretty confident they could do a good job. My wife and I planned on visiting my in-laws that live nearby, so we thought we'd drop her off prior to the start of the tourney. Traffic was worst than we anticipated, and we left a little later than planned, which resulted in me running about 15 min after the start time. Luckily (or unluckily) my first opponent was Houstonite Travis so he was understanding, plus we play each other so often that our games go very fast. So Travis pulled a fast one on me and decided not only to swap from Ten Thunders - the faction he's been playing for about a year or more) - back to Rezzers, and on top of that Reva! I had never faced his Reva before and was instantly worried. He seemed less confident though, as he thought this was probably his worst kind of match up. Rezzers tend to be very packed together, and this map had an obvious choke point in the middle, and his crew didn't have nearly the resilience he's used to with Rezzers. It seemed to be in my favor. At first the game seemed to be doing well. Without the Yasunori from his Asami crew I didn't feel that threatened about my Viks making it to his crew. I did the usual creep with the Viks, with terrain and the big models blocking avenues to the sisters. He threw Reva right into the scrum and killed one of my Winged Plagues. ...but Travis managed to make me miss my second attack on Sybelle, ending another Whirlwind. And with my last attack from Melee Expert he threw out the Red Joker in defense. I just couldn't believe it. It was such a magnificent play I couldn't even be mad about it (par for the course when playing against Travis). Well it goes without saying, with this kind of level of play, Blood died almost immediately afterward due to being in range of about 4 very angry and almost dead models. It went pretty downhill from there. 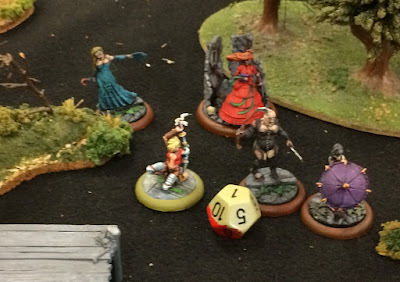 Reva was cleaning up model after model, with Corpse Candles blocking lanes and getting in the way. Travis played the crew like clockwork. It was just grasping at VP for my crew, I knew he was getting his full 10VP after Blood whiffed. It wasn't all that bad considering, as we ended the game 6-10. I managed to get 2 rounds of Turf War, a VP for Claim Jump, and all points for Set Up. This game, though, probably knocked me down a tier in standings and I felt that I should be able to pick it up in round 2. Steven is a relatively new player, and I think Sandeep was his first crew. I was a little worried as usually he's extremely solid, but I saw that he didn't have Cassandra so I knew this would be easier than usual - Cass is just messed up with Practiced Production. I set up Winged Plagues on opposite ends to prepare for Leave Your Mark. Either Hannah or the Hodgepodge were going to take Claim Jump into their hands as they were probably going to stay in the middle. Viktoria was going to take care of Headhunter for sure. In the beginning moves he took a shot at Big Jake who didn't get hurt. I set up the rest of my crew as usual (I can't recall a game where I don't move in the block formation I usually do outside of close deployment). He had Sandeep and some other models relatively close to each other past the river, so I knew that I should be able to take care of the master next turn as long as the Banasuva doesn't block my lane. Well, I won initiative and proceeded to run directly to Sandeep. I managed to easily kill him and the two models close by with AP to spare, all before the Banasuva came out. All in all it was a good play, and left Steven on the reactive side while I had no opposition to my VP. I believe at the end of the game I had managed to only lose a single model. I ended up winning 10-2 and was going to the third round strong. Steve was pretty flabbergasted at how I was able to kill effectively, but I told him that now that he's seen the trick he can better prepare for it. Plus it's a bit stacked against him, as I've been playing the Viktorias almost exclusively for 3 years, and he's a new player. He appreciated the game though, as he has the same mentality as me when it comes to learning games - get absolutely pummeled often, and soon enough you'll be doing the pummeling. So this game had me facing Hans, who I've previously played before with my Viks against his Lilith. After our last game he quickly decided not to use Lilith and repeat what happened last time, although I was more scared of him using Lilith than he was of my Viks! It was close deployment, and I got right on the line while he stayed waaaaay in the back. I knew with close deployment it would be easier to run certain schemes and so I chose Claim Jump and Search the Ruins, knowing he'd want to stay away from my crew in the middle as well as keep getting VP from Interference. I knew with Big Jake I could claim a weak corner while running schemes. I did my usual walk forward, and ended up getting my Winged Plagues engaged by a Changeling - for the rest of the game hahahaha! 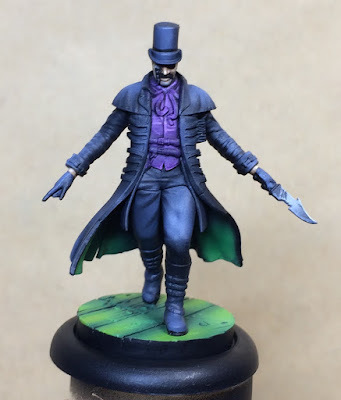 I was preparing for the best use of Whirlwind and figured I should get Envy and the Mysterious Emissary - mostly because they were close together, and I remembered that Collodi is actually pretty tough to kill with his dolls nearby. The route to them was much easier as well. As you can see I spread out pretty far due to Envy's ability to obliterate stuff. He ended up missing the Hodgepodge so I came out smelling like roses. I didn't get initiative, but due to an unsuccessful attack it was like I did! So what do I usually do on turn 2? I managed to catch a few models in Whirlwind and eat them right up. It seemed like it was easy pickings from this point on. ...and managed to kill enough of my crew to have me sweating! Not as weak as I thought, huh? In the end he managed to pick up from the loss of his key models and score a bit of VP. It was looking like he may get a win after all, but then he realized that I had markers around the center ready for Search the Ruins. This is when he decided to get to the middle, but it was too late! He picked up one marker, but then the Hodgepodge went and put one in its place. The game was mine 10-6, but it was pretty eventful! The scoring came down, and at Top Table Travis was playing against a very good Lilith player and ended up losing. 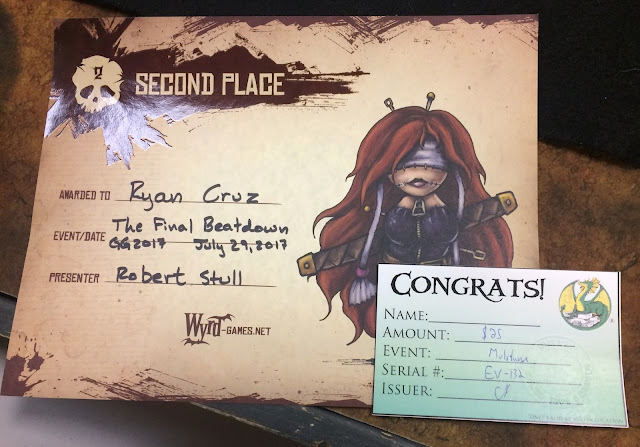 This, coupled with my large win in round 2 and decent win in round 3 bumped me up to second place! I got some Descent miniatures with my winnings as I don't need any more stuff for Malifaux. All in all it was a great sendoff tourney for Robert, we'll miss him dearly but he said he's coming to the next Houston one before he leaves. Oh, did I say earlier that I don't need any more Malifaux stuff? I think I died and went to heaven when they released this announcement for GenCon. Anyone who knows me knows I'm nuts for cats (we own five and yes we know that's crazy we regret it too)! The fact that this is a crew proxy for Hamelin makes it sooooo much sweeter! 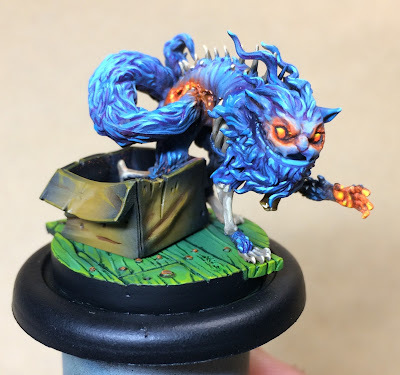 Hamelin is the only other Master I'm interested in right now in terms of competitive play, and making a kitty crew just makes me want to learn him so badly! I got a practice game with him this week and it was awful, so I've got a lot of work ahead of me! I can't wait to get this crew, and I'm definitely going to paint it. I mean, usually I want to paint stuff, but rarely do (I haven't even put together last year's GenCon crew!) but I'm painting this whole crew no matter what. I want to paint my cats as models hahahahaha! I mean, they're so awesome. Look at that Nix proxy! 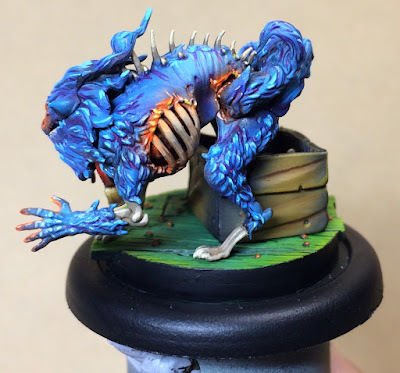 I'm going Cheshire Cat with a little acid trip on him, blues, greens, yellows, pinks, the whole works - like a Tzeentch model. The Stolen even have cats on them!!! So... yeah... I'm cat crazy. Also, they're called the Sisterhood of the Cat, while Hamelin's other box is called The Brotherhood of the Rat. It's just so darn clever. Oh, and litter box scheme markers. And yarn ball markers. So many ideas. Anyway, before I get even weirder, I'll let you go! So today I got a chance to put some paint to plastic! 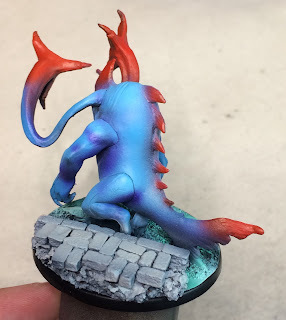 I wanted to get started on significant work for my Descent miniatures. 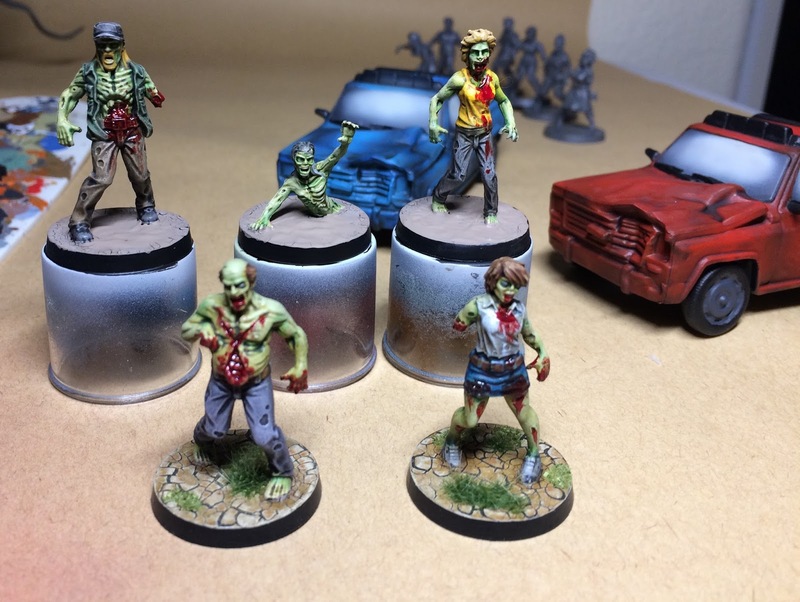 Although I've already painted the Zombies for the game as a test on basing I consider these Merriod models as my true first tries. 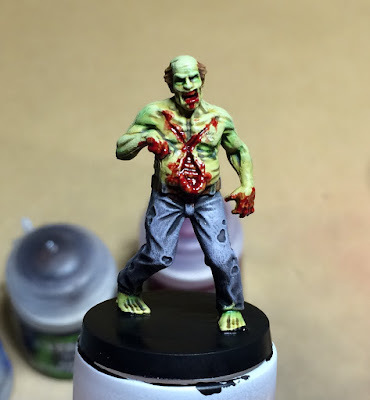 The Zombies are absolutely hideous, the sculpts are some of the worst I've dealt with, and I lost a lot of motivation after trying those models out. Content-wise I can't complain about the Zombies, as you get a ton of cool stuff in the box and one batch of bad models doesn't ruin the whole thing (especially with cool models like the Merriod). Also, outside of the missions where they're mandatory, they aren't going to get any use so a bad paint job isn't the end of the world. So as I was deciding on what to work on next my wife suggested the Merriods, as they're simply the coolest sculpt in the box tied with the Shadow Dragons. They are also my favorite monster in the base game due to their awesome abilities and annoying defense. 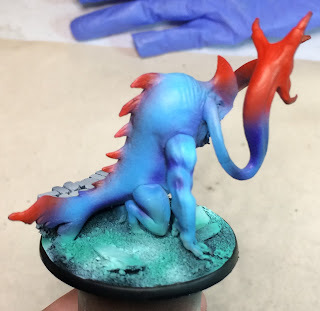 So I got to laying some base coats on the guys, then after getting into the groove I found that I got almost the whole thing done in a sitting! 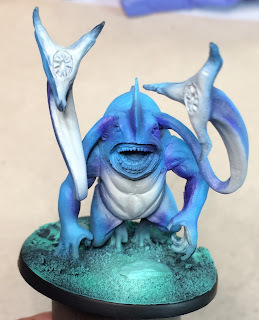 All I have left to do is shade and highlight the blue skin, after that add the water effects and other basing elements and they're done. They're suitable enough to play as is in fact. If I'm not especially lazy I'll shade the grey on the stomach and tentacles. It was also a cool coincidence that the base matched a tile in the game. 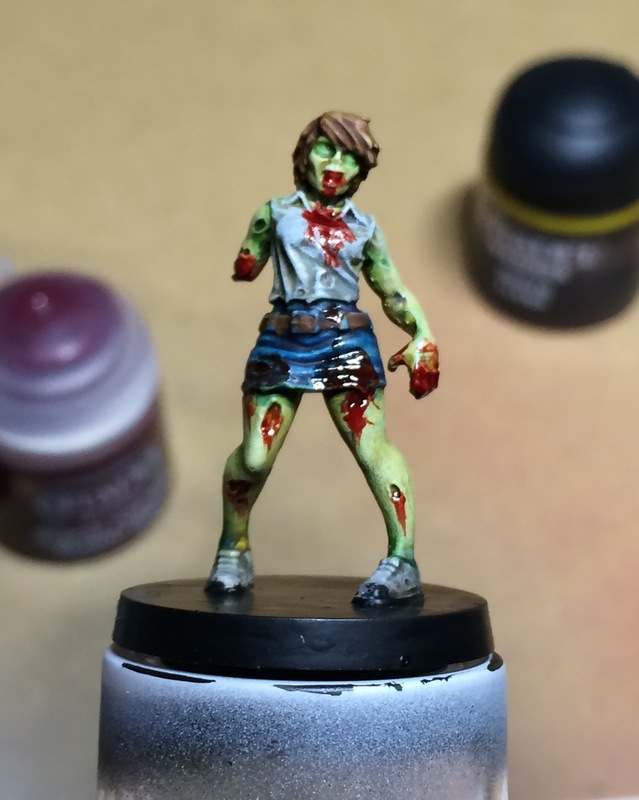 I didn't plan on it matching, as I tried to do so with the Zombies and didn't do such a great job. I just wanted to make an interesting base and figured even if it didn't match it would look cool. 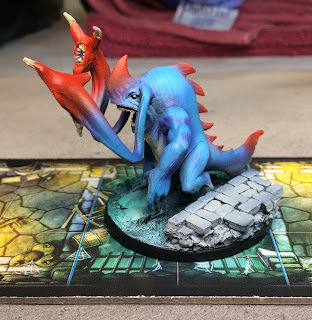 Overall it was a simple paint job, I didn't want to spend too much time on the monsters as I really am trying to follow through with having a fully painted set (at least of what I own). Lately I've been trying to keep in mind that not every model has to be perfect, and to try to get a standard that not only leaves me happy with the result but is also timely. I can't have every model done to the same 3-4 session standard, it's just not feasible especially with the new job demands. Anyway, here are some more pics and WIP, when it's done I'll give an update!